Cracking DraftKings: Is Tyrod Taylor a top-five DraftKings play for Week 1? Is Tyrod Taylor a top-five DraftKings play for Week 1? Obviously, priced at the QB minimum, Taylor represents the best numeric values of the week; he’ll have obliterated his salary expectations by the second quarter. But what does that value mean for your lineup? After all, if he only brings you eight points or so, you won’t care how by much he exceeded those expectations. You’ll be bummed over the eight-point QB week you’re staring at. Well, h-value tells you to be confident. H-value is our method of marrying a player’s scoring expectations to his per-dollar value. And the equation tells us that Taylor is, by my projections, the fourth-best QB play you can make this week. That should excite you enough. But how likely are my projections to hit the mark? For Taylor, a complete unknown as a passer, the numbers expect about 6.8 yards per attempt, a low mark but fair for a first-time starter in a ho-hum offense. They don’t love his touchdown potential, given the lack of health and consistent dynamism throughout the Bills offense. Obviously, his true value will be tied to his rushing numbers; specifically, will Taylor put up good ones or great ones? Last year, three QBs (Russell Wilson, Colin Kaepernick, Cam Newton) soared above all others in rushing production, and their average game featured a rushing line of 6.8 rushes for 42.3 yards. It would be naïve to expect that top-tier production, so my model projects Taylor at 5.1 for 30.8. But it’s easy to see from Wilson, Kaepernick, and Newton that there’s room for more, which means that, as the #4 value play of the week, Taylor may still be undervalued. 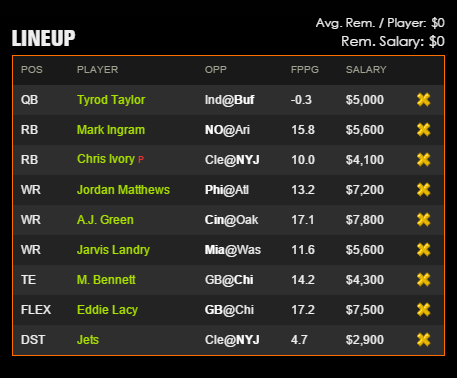 I’ve plugged Taylor into one of my two GPP lineups. I’m not expecting fireworks, but I am looking for a high-end QB2 performance in the hopes that the rest of that star-studded lineup - - on the right, and truly a sight to behold - - simply bludgeons the rest of the field. H-value measurement tells me that’s a very fair gamble.